Fr. John Romanides attached great importance and weight to the neptic tradition, because there is detected difference, besides dogmas, between the Orthodox tradition and the tradition of the Franco-Latins and Protestants. Indeed, he found this in the terms "analogia entis" (analogy of being) and "analogia fidei" (analogy of faith) that consist of different ways of experiencing the revelation of God. Analogia entis refers to an analogy between the uncreated and the created, that God created the world from archetypal forms and the salvation of man is the return of the soul to the ungenerated world of ideas. This is classical metaphysics, from which was influenced the theology of the Franco-Latins. Thus, according to this theory, one can know the essence of God, if they know the essence of created beings, using human logic. This tradition was expressed by Barlaam, which is why Saint Gregory Palamas responded to this so-called "stochastic analogy." Analogia fidei refers to man's relationship with God through faith, as revealed in Holy Scripture. This tradition says that the revelation of God is not given through philosophy, but through Holy Scripture, which is the word of God. Hence, when one studies Holy Scripture, they come to know God and enter into communion with Him, because the revelation of God has been deposited into Holy Scripture. Fr. 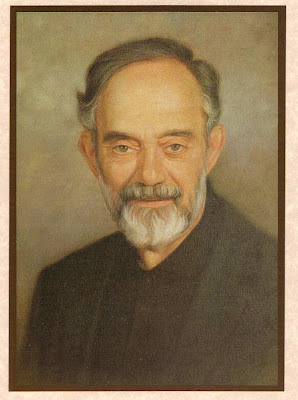 John Romanides claimed that these two traditions (analogia entis - analogia fidei) characterize Western Christianity and are foreign to the teachings of the Fathers of the Church. The Orthodox Church teaches that in order for someone to encounter God, it must be based on personal communion with the uncreated purifying, illuminating and deifying energy of God, which is experienced in the Church through the Mysteries and asceticism. Asceticism is the neptic-hesychastic tradition which is a precondition for dogmas and the path by which man encounters God. Thus, the knowledge of God is not tied to philosophy, nor simply by reading Holy Scripture, although it is important because it captures the experience of theosis, but it is tied to the experience of the neptic-hesychastic tradition and the entire ecclesiastical life. This neptic tradition of Fr. John he described as therapeutic or healing, a term that we encounter throughout the biblical and patristic tradition, because with purification and illumination people attain theosis, communion with God through the healing of man. Characteristically Saint Gregory Palamas presents the Panagia as the model hesychast, having lived in the Holy of Holies and used the method of "the treatment of quietude." This is why, he writes, when man attains the vision of God, then she "is the only example of a truly healthy soul." Thus, "theoria is the fruit of recovery, whose end and form is deifying." Therefore, man is deified, "not through stochastic analogy," but through the treatment of silence, by which he is healed. This ecclesiastical tradition is the basis of the theology of Fr. John Romanides and was the practical consequence of his theological research for Ancestral Sin. This is why he argued that if one does not clearly understand the deviation of analogia entis and analogia fidei from the theology of the Prophets, the Apostles and the Fathers, then they cannot perceive the heresies of Western Christianity, but also the value of the neptic-hesychastic tradition of the Orthodox Church.